Headliners for Let’s Rock Norwich 2019, which will take place on Saturday, May 25, have been announced as Billy Ocean and Erasure’s Andy Bell. 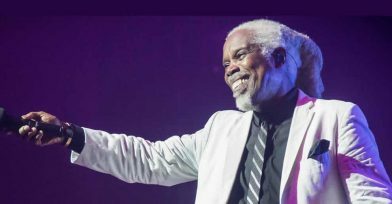 Billy Ocean is the biggest black recording star Britain has ever produced, one who has sold over 30 million records in his lifetime to date. He has collected a pile of Gold and Platinum records across the world and hit the number one spot worldwide in the pop charts including the USA, Australia, Germany, Holland, and the UK. Billy has achieved extraordinary success as both an artist and a songwriter. Andy Bell is best known as the Lead singer and co-songwriter of the English Synthopop duo Erasure who have sold over 25 million records worldwide and charted with some of the most beloved songs of the past 30 years. Hits include “Sometimes” “Oh L’Amour “Chains of love” “Always” and the classic “A Little Respect” among dozens of others. Erasure achieved 24 consecutive Top 40 hits in the UK between 1986 and 2007 and are still writing and performing on tour to this day. Andy has released 6 solo albums as well as continuing to work with his Erasure partner Vince Clarke, when in 2014 they released their 16th studio Album. Other acts include Marc Almond, Midge Ure, Thompson Twins’ Tom Bailey, Go West, Nik Kershaw, Kim Appleby, From The Jam, Limahl, Thomas Dolby and Cutting Crew. With a fabulous line-up of artists to bring you the very best of the 80s, and an action packed day of general 80s madness, there is plenty to do for everyone at this Family Friendly Festival!